Coffee was introduced into this country in the mid 17th century and the first coffee house was set up in Oxford in 1652. These establishments soon became an important part of social life. Shortly after its introduction, more than four hundred coffee houses sprung up in London alone and, by 1675, there were over 3,000 coffee houses in England. Rather like Starbucks, Costa Coffee and Caffe Nero today! A George V Silver Four-piece Tea Service, maker Elkington & Co, Birmingham, 1934/35 (FS41/7), which realised £750 in one of our Fine Sales. The first coffee pot was hallmarked in 1681 and their general design was of tapering cylindrical or tapering baluster form. Their spouts tended to start half way up the body of the pot, whereas teapot spouts started towards the base of the body. Tea was introduced into this country by the Portuguese, Catherine of Braganza married Charles II and brought tea to the English court where it gained acceptance with the Aristocracy. It wasn't long before the coffee houses were also offering tea as a beverage. As there was no established trade with tea growers, it was an extremely expensive commodity costing between £6 and £10 per pound. Highly prized, tea was not for the poor and early teapots were small. Equally too, so were tea cups and teaspoons. A George V Silver Five-piece Tea and Coffee Service, maker William Aitken, Birmingham, 1911/15 (FS40/33), which sold for £650. As time went on and the tea trade was established with China, India and Africa, the price fell and so tea drinking was taken up by the middle and lower classes. With the drinking of tea and coffee came a whole plethora of accoutrements including cream or milk jugs, sugar basins (sucrieres), spirit kettles, tea urns, sugar nips and tongs, caddies and caddy spoons. 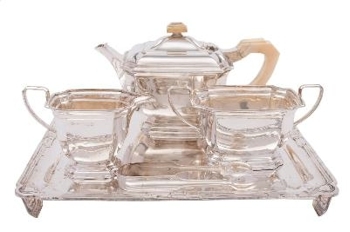 Tea and coffee services reflected the different decorative periods and styles, which lasted well into the middle of the 20th century. With tea being a national obsession, it is impossible to say just how much silver has gone into the making of pieces for the preparation, serving and consuming of this beverage.